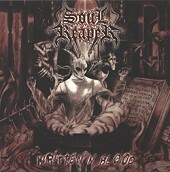 SOUL REAPER is yet another band in the new wave of death metal looking to carve themselves a niche in the scene. Their incredible talent and merciless musical onslaught will serve them well in their endeavors. They combine the technical precision and utter ferocity of the classic American death sound and mix it with a healthy dose of the melodic steamrolling death of Europe. They also throw in things like occasional twin guitar calisthenics for a really sharp edge (the end of the title track sounds flat out Maidenesque!). Unfortunately their superior musical presence is compromised a bit by their tired rehashing of the "We are more satanic than thou" image and lyrics. An approach so overdone in extreme metal that even the most diehard Satanist must be growing weary of it. It is too bad that the creativity expressed in the first-rate song writing on "Written In Blood" is undermined by taking such a generic path. C'mon, VENOM was doing this two decades ago! Death metal is without question an evil sounding music and SOUL REAPER sound even more evil than most so they could easily let that fact set the foundation for their exploration of darkness and use their image and lyrics to do something more original and dangerous. Being satanic just isn't menacing anymore. If you really want to scare the hell out of people try being intelligent, well spoken and eloquent. Nothing is as threatening to the status quo and the "norm" as someone with alternate ideas that actually has the wherewith to articulate those ideas in a way that makes sense.